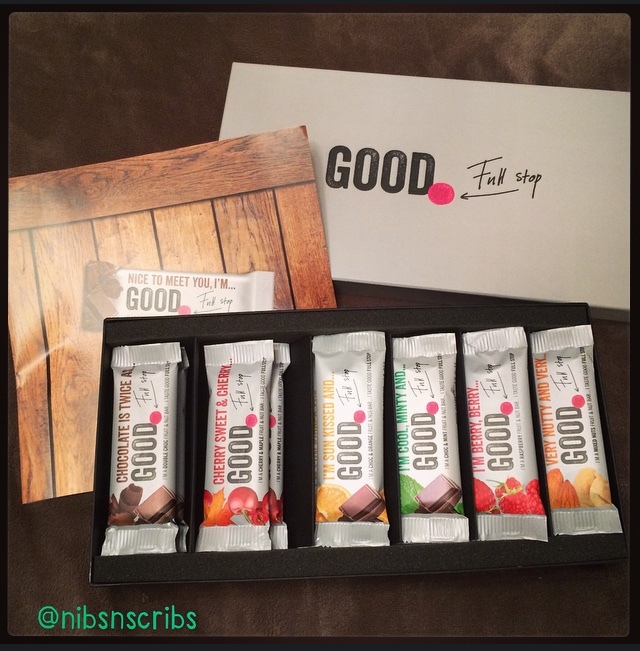 In the interest of being healthy but still wanting to have a treat without the guilt, I have been trying out various ‘healthy’ bars. But can a fruit and nut bar be successfully disguised as banana bread, apple crumble or even various arrays of chocolate? I am rather dubious as to whether mulched up dates and cashews can really pull it off, and whether I would choose one over a choccie bar, but if they can then miracles do happen. 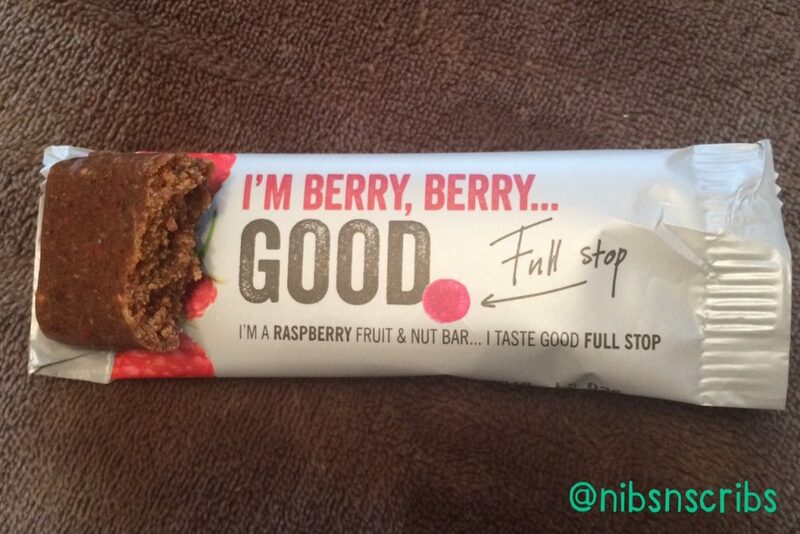 Recently over on Twitter Good Full Stop gave me a follow and I was more than intrigued by their bars. They very kindly sent me a sneak preview of their bars. In all honesty I thought it would be just one or two, but to my surprise they arrived in this sophisticated sleek presentation box, filled with three of each of their flavours – *very happy face*. What is in a Good Full Stop Bars I hear you cry ?? 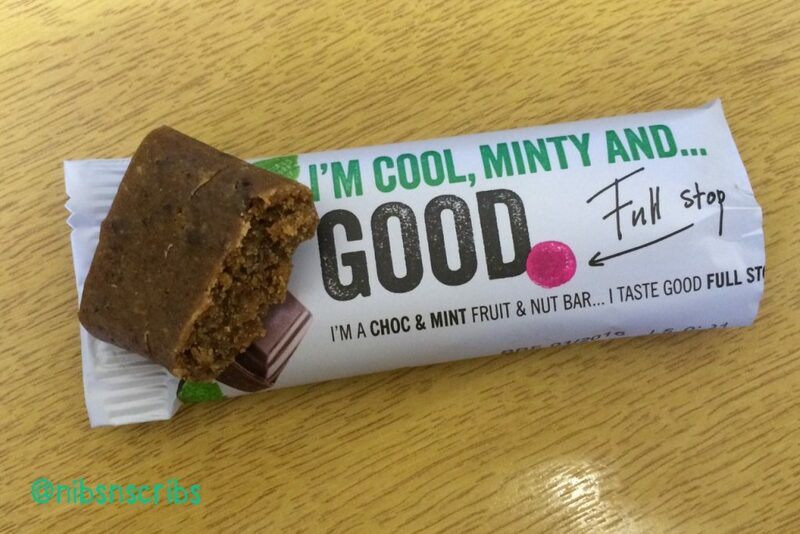 The basis of these bars are dates, cashews, rice bran and natural flavourings. 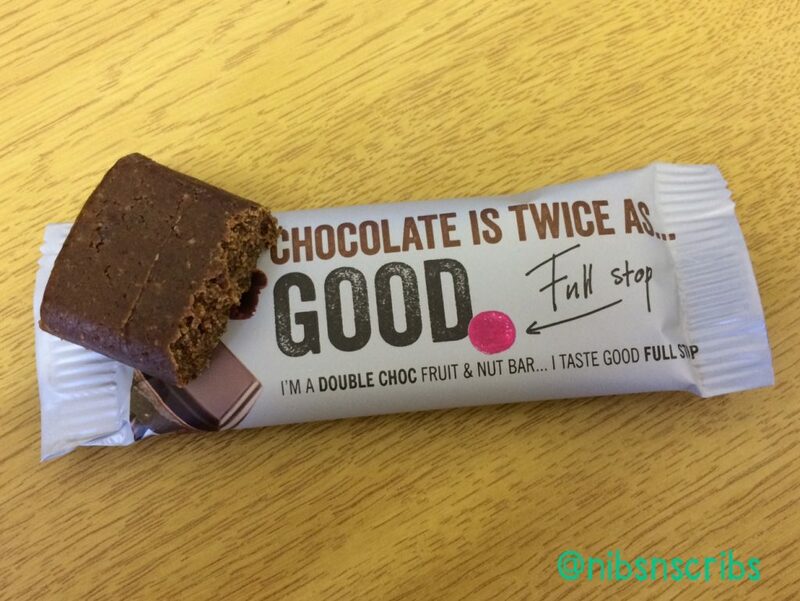 Simply each fruit and nut bar is 1 of your 5 a day (bonus), are made with the finest wholesome and natural ingredients, contain a natural source of copper and fibre, have no preservatives, artificial colours or flavours, are gluten free, and suitable for vegetarians and vegans. I think that checks all the boxes. Cherry & Maple Syrup* – 137kcal, 14g sugar, 0.9g sat fat. Anything cherry flavoured and you have got my attention. 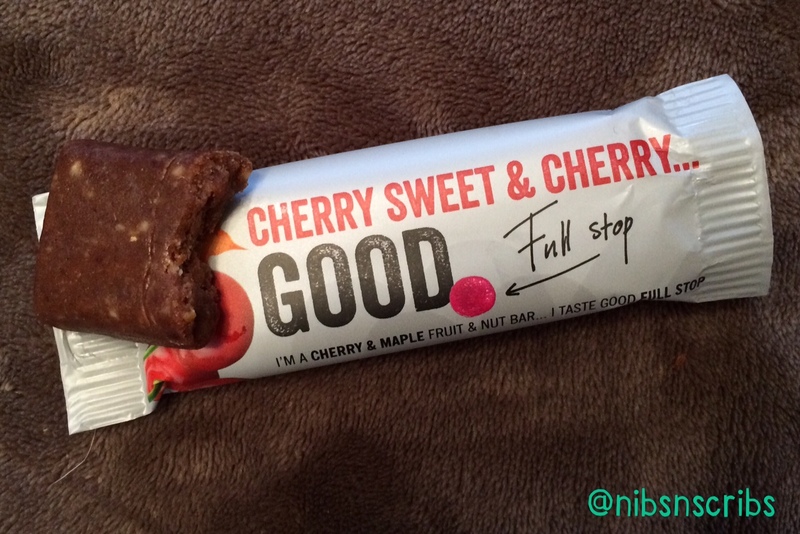 You can see the slight redness from the cherry juice and freeze-dried cherries, the bar was nice a chewy with a hint of cherry, and just enough sweetness. To really be a winner I would love to see the cherry flavour being ramped up! Double Chocolate* – 142 kcal, 16g sugar, 2g sat fat. They haven’t settled for single chocolate, no no, they have gone for the double whammy of double chocolate. What a wise choice. Why go single when you can go double? I love this bar, it smells and tastes of rich chocolate and reminds me of eating dark chocolate. Perfect pick me up for the 3pm slump at work. Chocolate & Mint* – 136 kcal, 16g sugar, 1g sat fat. Opening the packet and instantly you get that minty smell. I like the minty fresh aftertaste but in the midst of eating the bar I am not quite sold. In my opinion the flavours didn’t marry in the way I would expect from chocolate mint (aka an After Eight in my case!). Unfortunately this is my least favourite bar. Fruit & Nut* – 137 kcal, 15g sugar, 1g sat fat. Probably the most classic of bars and they have delivered on this number. 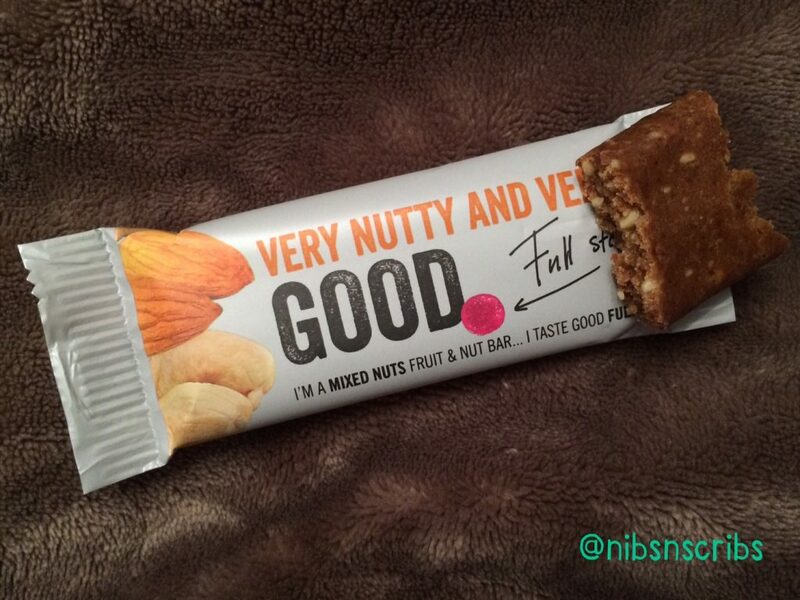 Lovely bar, good balance of fruit and nuts – cashews, hazelnuts and almonds, suits well for when you don’t want something too sweet or chocolatey. Raspberry* – 131 kcal, 16g sugar, 1g sat fat – You can see the little raspberry pips and can taste them as your chewing. Nice little bar, not my favourite but equally not my least. Chocolate Orange* – 124 kcal, 16g sugar, 1g sat fat. I hear chocolate orange I think of Terry’s Chocolate Orange, except it’s not Terry’s its mine!! Yum. Yum. Yum! This bar does not disappoint in the slightest, and is by far my most favourite, in to the fact I forgot I was even eating a bar that is made of dates and cashews! Defiantly a winner! There we have it, that rounds up Good Full Stop products. Would I recommend them? Yes! Go try these little bars, they’re perfect for on the run, keeping in your desk at work and really just about anytime you need to starve off the hunger. 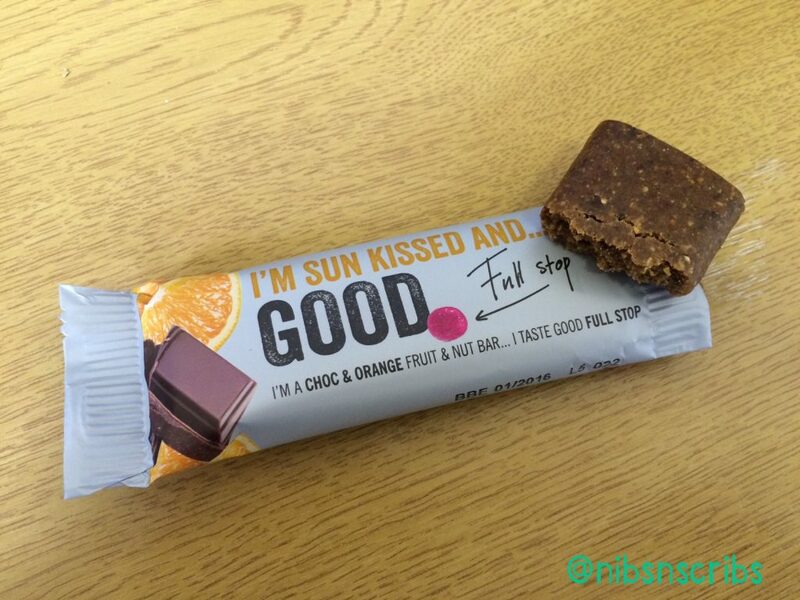 If you want to try just one go for the Chocolate Orange, you won’t regret it!! Take a look at their website and keep up to date with all their latest news here. Their snack packs are coming soon and I cannot wait to try them! 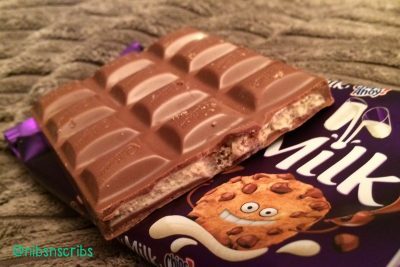 Next Post Cadbury Dairy Milk Chips Ahoy!